Since our establishment in 1972, that DTS Group has been providing a diverse range of customers in a wide variety of areas-including finance and communications-with every system-related service they require from consulting all the way through to design, development, operations, and infrastructure building. We have striven to be a system integra tor that supports high-level business needs and provides added value to our customers. In addition, we have taken part in large projects such as the unification of core computer systems for financial institutions as well as infrastructure unification among telecommunication carriers,based on our industry-leading operational knowledge and high qu ality, as well as our developmental achievements over many years, and, as a result, we are trusted by our customers. With the recent technological advancements in IoT (Internet of Things), block-chain, artificial intelligence, robotic process automation, etc., the environments that surround our customers are changing ever more dramatically. In order to respond to these technological and social needs, DTS Group is continually enhancing the value of our customers’ businesses and provide optimized IT services. 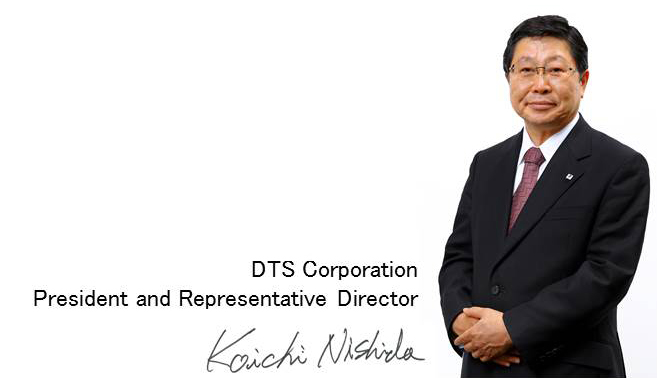 DTS moved its headquarters from its longtime home in Shimbashi, Minato-ku, to Hatchobori, Chuoku, in October 2017, as the company marked the 45th anniversary since its establishment. This relocation consolidated some of our business offices, enabling better collaboration among different departments. We will also unify across the board following a new company principle, "DTS Group Way," established on the group’s 45th anniversary while transforming the company into a value-creating organization. DTS Group aims to be our customers’ first-choice business partner. Copyright(c)DTS CORPORATION All Rights Reserved.